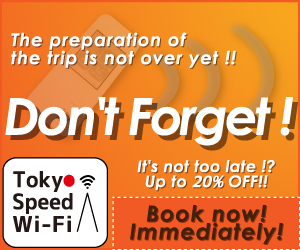 Do not forget your Wifi in Japan! Do not forget to eat YAKITORI too ? Yakitori is a Japanese type for skwered chicken into kushi. A type of skewer typically made of steel, bamboo, or similar materials and where grilled over a charcoal fire. Before or after grilling you should put seasoning with tare sauce over the whole part of the skewered meat. Yakitori are typically cooked using step by step methods. It can be done also at home. To facilitate cooking the meat will be cut into small, roughly uniform shapes and then skwered with kushi. After the yakitori are seasoned and cooked. Charcoal is the preferred method of cooking as it produces high heat and strong flames while giving off little to no water vapor. Allowing for the ingredients to be cooked quickly while imparting a crunch texture to the skin. Eating with Yakitori is best accompanied with sweet or chili sauce. It has a perfect match sauce in eating yakitori the tare sauce consisting of mirin,sake, soy sauce and sugar. Other common spices include powdered cayenne pepper, shichimi, Japanese pepper, black pepper and wasabi. You can find it anywhere in Japan.